My friends told me last week that they wanted to take us to a new restaurant. “The Barrel, have you heard of it?” Nope. Never heard of it. Apparently haven’t spent enough time on that side of town because had I ever driven by this gigantic barrel I’m certain I would have noticed! As we pulled up, I was amused by the building, but then thought that maybe the hype was about the fun of eating in a barrel and that the food might be secondary. Turns out I was wrong! It was delish! It’s an izakaya so they have an extensive drink menu but also a huge food menu. There are pages and pages of things to try (and it’s all in English). We had huge salads, lots of sushi, yakitori, fried rice, and shrimp tempura before we got too full for more. I’ve already started my list for next time– I’m trying some of the pastas, pizzas, and beef teriyaki to start. They brought a complimentary appetizers to start and once they saw the kids they appeared with special little plates for them– strawberries and cream, bananas drizzled with chocolate, and persimmon. It looked so good I was a little jealous myself! We sat downstairs in one of the semi-private back rooms which was great. The funny thing, that I hadn’t experienced anywhere else, was the phone in our little room that was a hotline to the wait staff. Pick it up, ask for whatever you want and things just appeared! It was all tatami mat seating downstairs, but it was the kind with a hole in the floor for your feet below the table. There is also an upstairs that I didn’t see. Hours: Tonneau is open for dinner starting at 5pm every day. We were seated and given the mandatory appetizer. There was a Japanese menu with a half off special until 8 PM on the table. When the waitress began explaining, the owner told the waitress to take away that Japanese menu and give us the menu for Gaijin (Americans). The menu for Americans said nothing about half off until 8 o’clock, in fact the menu was a very different menu. When we insisted that we wanted to see the original menu, we were told that the entire restaurant was reserved for the evening. When we explained that we knew he was lying, the owner got very embarrassed, left out the back door. He left his employees to communicate with us. He phoned in and asked his employees what was happening. With all the turmoil happening in Okinawa, it is very sad to know and experience being treated differently. The fact that we were given the “Gaijin” menu is no less than a perfect example of segregation. It is very clear that the Japanese menu is favored with the half off specials Americans are not welcome to. Feeling very discriminated against…..How’s that for dinner? Two points : (1) Your written directions to the Barrel are OK, but your map pin, address, and coordinates are all off by over a kilometer. 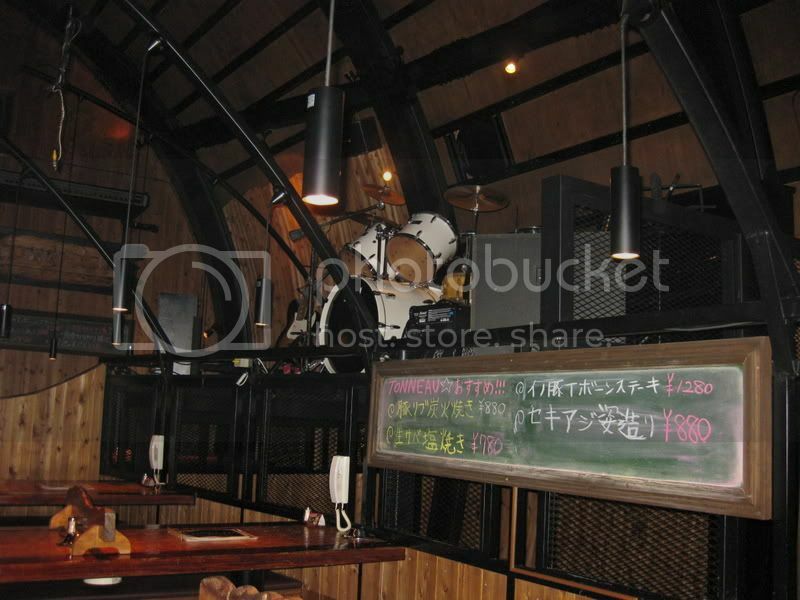 The Barrel is located at KOJA 1115-2 ( 沖縄県沖縄市古謝1115-2), Google Maps 26.3433714, 127.8277256 (or Google Earth 26°20’35.41″N 127°49’37.81″E, where you can see the Barrel itself from “outer space”), and…. (2) “RESTAURANT” is not the word to use for this place. It’s more like a fancy “PUB”, or a “BAR THAT SERVES FOOD””. Using “Restaurant” in the description will give the wrong expectation to English speakers, and thus affect the outcome of the reviews. Similar to an “Izakaya” (but not quite), they advertise themselves as a “Bistro & Bar”, and it’s just a fancy place to drink, drink, and drink some more, while slowly picking away at any “finger foods” and small-plate offerings from their menu. Rob, Thank you for letting us know! We will change the map pin and coordinates to reflect your directions! Worst restaurant ever! Our order took so long to arrive. We waited for an hour for the rest of the ffod to come, our kids was complaining because they are hungry. We cancelled the rest of the order. my wife ordered sea food spaghetti and it does not look like what they have in the menu and the food was dry and cold. Never go here to eat. You will be disappointed. You were warned!!! We went and everything was awesome. My boys really enjoyed it. We actually stumbled across this getting lost, trying to get back to the Foster area from Sports Depot! I’m taking my Marines there for dinner tonight actually! Does this place have the phone or ringer to get service and order? Izakaya’s are fine for families. We go all the time, but as Teresa said, you don’t usually order only one thing for yourself, everyone shares. It makes for a much more fun experience. And you can ask them to bring several items at a time if you prefer it that way, but they normally bring each item once they are ready and some items can take a while to cook. Oh yeah, don’t have a phone number, but woud be worth finding cause if you don’t have a reservation (at least on a Saturday night), you will be stuck eating at the bar upstairs, often getting ignored by the busy overworked waitstaff. we DID have a reservation and it was group of adults. don’t arrive hungry? to a restaurant? we were also trying to ‘drink plenty’ but couldn’t get those either. this website is for reviews and peoples opinions, so like you said, ‘try to be more open-minded’ and don’t take it so personally. Tried this restaurant last night and will NEVER go back! We did everything right; had a reservation and a group of 6. Got there to eat at 7 and it wasn’t that busy. We were sat upstairs and majority of the group ordered drinks. which is where the problems began. The drinks for four people took at least 20min to make. The appetizers were cold and nasty, three meatballs for 350?? It took us till eight to get a waiter to come by and take our order and it was 845 when I got my side salad. The food came in intervals, which sucked because we were eating as a group and it made it so one person was eating while everyone else was waiting. Once the food came majority was cold or the wrong order. We were very upset when it was after nine and only two people had gotten food. The staff was very rude and wouldn’t even answer the phone that was at the table. It was so bad we just wanted to get up and leave without even getting the rest of our food, which we did. Then the check… oh what a mess. Apparently you have to pay as a group no matter what. The check was all in Japanese and made no sense. Long story short. Cool building, nice atmosphere, Horrible service, cold food, very unfriendly waitstaff!!! Will not be going back!!! “The check was all in Japanese and made no sense”…what do you expect? You’re in Japan! LOL. Izakaya 101 – Izakaya’s are not ‘family friendly’ restaurants. The point is to drink, eat small appetizers (that are shared between everyone) and then everyone splits the bill. Try to be more open-minded and I suggest making Japanese friends so you get how it all works. I’ve been there plenty of times without any issue. The food takes longer but the point is to drink plenty, eat little. You are not supposed to arrive hungry. Its supposed to be a drinking spot. I hate when people expect something in another country and have no clue what they are talking about. Yes, we did have to pay for the otoshi/appetizer, but unlike other izakayas, the portions here are bigger than the typical mini-plates. Yes, having to pay for an appetizer that you didn’t order can be a turn-off, but at least we don’t have to tip, right? I certainly didn’t shun this restaurant because of the appetizer served, although I didn’t care for it. (all pickled items when we went, and I don’t like pickled things). I won’t return because I didn’t care for the food overall. My overall experience wasn’t great-and there are far too many other restaurants (and I’m not referring to Chili’s or MacGrill) that are far better to even consider returning here. I feel like you people all live in Japan, but have never been to nor know anything about it! Have NONE of you heard of or have been served an otoshi before? It’s pretty much the defacto standard in ANY Japanese Izakaya/restaurant. It’s a seating charge designed to keep people from bar hopping, especially in smaller places that only have 4 or 5 tables. Japanese spend lots of time eating and drinking (which = money), and can’t afford to turn away people because a table is filled by someone that will just eat like 2 items and have juice and leave in less than an hour (most Americans). Make sense? It does to them, and to me. But I find it really really odd that no one has heard of this?? It’s part of the Japanese culture, and should NOT be a reason to shun a fine establishment. We have been here once. Although I know lots of people who love it, we didn’t really care anything we ordered. It was okay, but nothing spectacular. We won’t be returning. Great atmosphere but that’s the only good thing about this restaurant, we won’t be going back. Really dislike the fact that we had to pay for an appetizer we didn’t like, didn’t want and didn’t eat. We went for dinner tonight. It is one of my new favorites. I really like the family style dining, it’s nice to have such a variety of delicious foods. The price was very reasonable and we all left feeling very satisfied. I think the atmosphere was fun and it is a great place to bring visitors. My family and I went to this restaurant for Mother’s Day. We found it, no problem. It wasn’t busy and they seated us right away. They took about 15 minutes to get our drinks/orders. Then we had to move. Then we sat and sat for about 30 minutes before we recieved our first order. Then the next one came 15 minutes later and so on for 6 different orders. 4 out of 6 of the things we ordered were cold (not supposed to be) when we got it. We had to remind them to bring out another drink and that took another 20 minutes. About halfway through the meal, we were contimplating cancelling the rest of the order and leaving. We were there for about an hour and 45 minutes and most of it was just sitting and waiting. Oh and the food was bland. Bring your own salt and napkins. All in all, I would never go back there again. It was by far our worst restaurant experience here. So, if you are in to places like this…have at it. I don’t think it was worth the money or time we spent there. We’ve heard they do all you can eat/drink for around $40 but you have to call ahead. Does anyone have more info on this? Sorry I forgot to mention the parking. We got there at around 7pm and had to park in there overflow parking. The lot was nice and close, but when we left we were blocked in because of how they park people. The attendant had to go and get the person to mover there car. I would just suggest to go early. My husband and I went for our anniversary and enjoyed it. We walked in and chose to sit upstairs, will not do that again due to the smoky conditions. The appetizer is not complimentary, but they do let you know when you walk in. The food and service were both great will definitely go again. We ate there about a month ago and I loved it. I had a ginger grape cocktail which was delicious. We made reservations and ate upstairs, loved the atmosphere. We got appetizers of shrimp and different tempura. I had the bibimbap and some octupus and all I can say is I loved the food! It is a nice place for kids too, our friend brought their three year old and he had fun. I am probably going back this weekend but taking my teens with me but I think they’ll enjoy it. All in all, a lovely place! @Nick–11750 for 9 total people? Not bad in my humble opinion. Just about $12/person. I’m also looking for a working phone number in order to make a reservation…I called the number listed above, but it was just an answering machine. I called during their regular business hours. Any help would be fabulous…I’m trying to get reservations for our anniversary! thanks! No they take credit cards there too! We loved this place. It was a little more than I was expecting to spend. 11750 for 4 adults and 5 kids. I recommend the chicken broil pizza and the beef and garlic. YUM! Does anyone have the phone # for Tonneau – The Barrel Restaurant?? I suggest following the directions for coming out gate 2 if your coming from Kadena. It’s supper easy to find your really only making 2 turns. We went their tonight for the first time with our almost 2 year old son. It was so good and we had a great time! I highly recommend this place. We will definitely be going back again. My husband and I tried to find this restaurant this past weekend, and we couldn’t. We followed the directions to a t, and still no luck. Can someone help? I am coming out of gate 3 on Kadena. I just went Sunday night and they gave us the wrong sushi order. They then brought us the correct order, and dessert (for everyone) to make up for their mistake! Awesome service. I don’t think they are open for lunch. They take yen and most major credit cards i believe. Their tempora is to die for! Wow it all sounds so delicous. Sounds like a great place for a lunchdate. Do they only take yen? Sorry, I gave bad directions from Yomitan area. When you are on 16 and looking for 330, you won’t find it. It’s because it’s actually labeled 75, which eventually becomes 330 later. So take Right on 75, go about 1 mile, then Left at A&W. My husband and I went there last night and found a good direct route to Barrel restaurant from Yomitan part of the Island. Take 58 South, take left at 16 (big intersection), this dead ends into a T which is 74. Make Left onto 74, then go a few miles (you will go past Kadena Gate 3 on your right), make L onto 16 (yes again), then go a mile or two, make a right onto 330, go about 1 mile, and make L at the A&W (on left side), go 1/2 mile and it’s on the right side, large barrel, small parking lot. Without traffic took 23 minutes from Nagahama Yomitan. Appetizers are automatically charged, like 350 yen per person, it was some kind of tiny fish (eyeball and all) fried in tempura batter, another squishy ball thing soaked in fermented something or other, and some pickled veggie I didn’t recognize. Tried but didn’t eat or like any of it. Actual food ordered was great: The basil steak is truly delicious, similar and slightly better than the beef teriyaki at Yoshi’s, didn’t taste any basil though, which was fine. Smoking allowed throughout which is a negative for us, though with the vaulted (barrel) ceilings the ventilation is decent enough to disperse it. does anyone have a phone number for this place???? Just in case anyone is interested, here are a few pictures from the upstairs area at Tonneau. Love the food and the phones at the tables! I ate there and it was very good! trouble because of seperating the bills. But all in one it was very good! We live about 5 minutes from this restaurant and have only recently eaten there! We have a six year old and a little baby, so we didn’t think this place would be good for kids. We were wrong! We went early around 6. Its very dark and we were seated upstairs. The food and drinks were excellent! The appetizers do cost 700 yen a person, a wee bit of a downside, but they have great wines and the bar area upstairs is nice and big. It looks like a great place to hang out late at night or to bring a date! If you have small children I do recommend going early. This is defiantly a place you have to try! Yep – appetizers are not free. They bring them and you’re charged, they show that to you on a sign when you enter. But the restaurant is reasonable for sure despite that fact. Sorry about the appetizer mix up! They did not tell me there was a charge and I didn’t notice that the bill was higher than it seemed it should have been so I just assumed. I admit I didn’t go through it so I have no idea what they charged me for! As far as prices go, we had 4 adults and 3 (small) kids all for under 10000 Yen. That was with drinks and ordering way more food than we needed. Even if I did pay for the appetizer I’ll be going back– it was so good! This is one of my favorite restaurants 🙂 Yes, they do charge you for the appetizer, but our bill last time came to less than 5,000yen and we ordered A LOT of food… too much probably! We went the first weekend in Nov. and were handed a sign that says they will bring you an appetizer and how much the appetizer costs and that it can not be taken off the bill. So it isn’t complimentary, but you have to get it. However, it is a really good restaurant. The sushi we tried was excellent and my chicken terriyaki was yummy! I LOVE this restaurant. We got little appetizers when we sat (fish, a plum and something else) but I didn’t pay attention to if it was added to the bill or not. 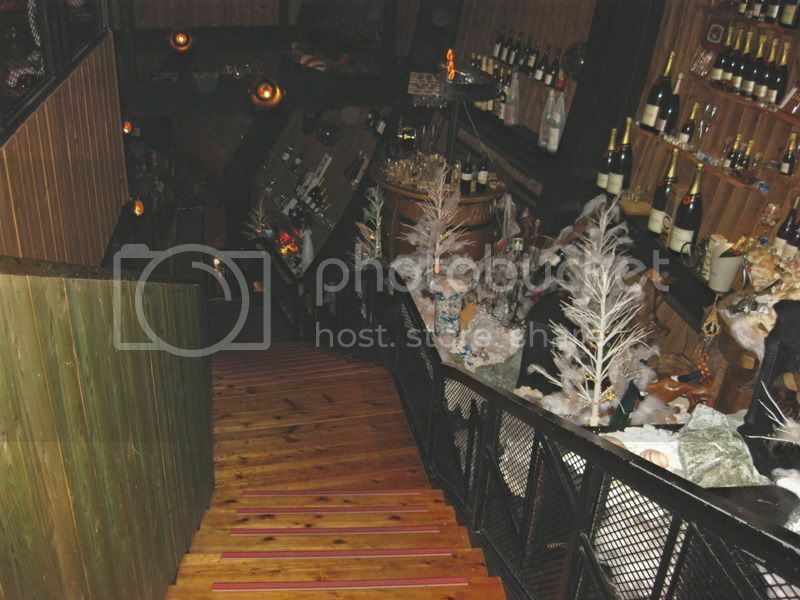 The upstairs is just like the back with the same tables. 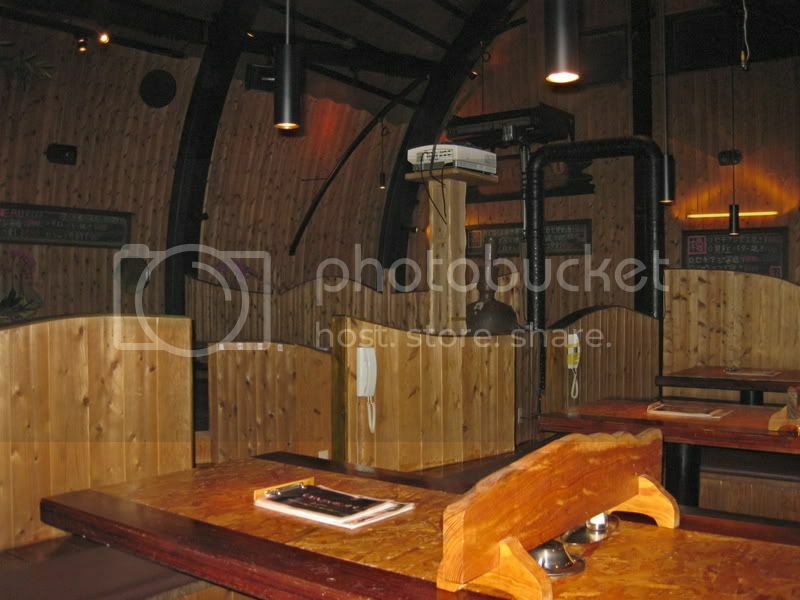 Plus there is a large bar and a bathroom where the stalls are separated by an aquarium! This is going to be our go-to restaurant whenever we have out of town visitors! Complimentary appetizers? We’ve been there a couple times already – LOVE the food but we were told both times that we would be charged for our appetizers and for 3 adults and a 22mth old it was 1,400yen just for starters. Has things changed since we’ve been there last?